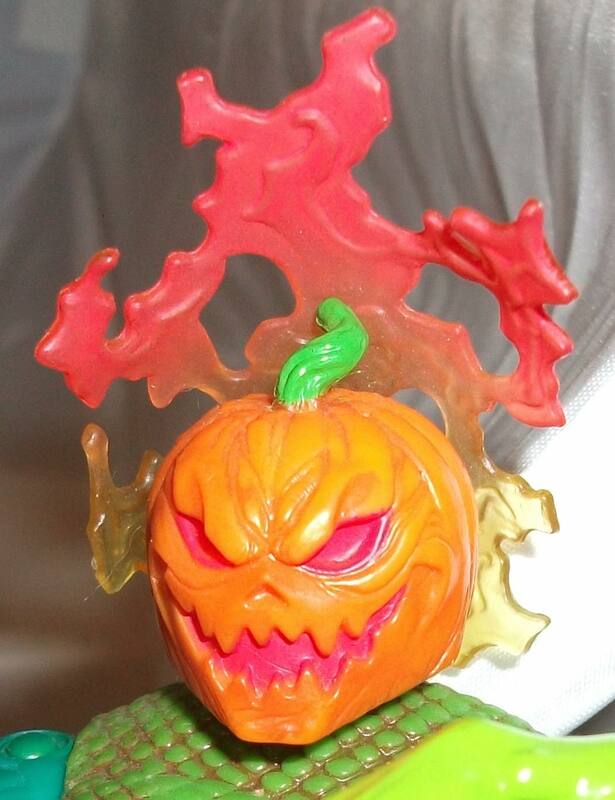 In my last post I reviewed the first ever Jack-O-Lantern figure which was released by Toy Biz in 1998. 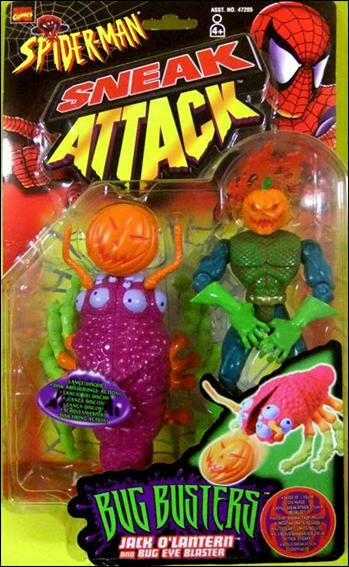 Today I’m going to review the brand new 2016 Jack-O-Lantern figure produced by Hasbro. Before I start talking about the actual figure allow me to continue my history lesson on the character. In the last post we left off after Jason Macendale had ceased being Jack-O-Lantern in order to assume the guise of the Hobgoblin after he’d had the Goblin murdered. Things only got more complicated from there. His pumpkin headed alter-ego lived on though through a number of confusing resurrections. 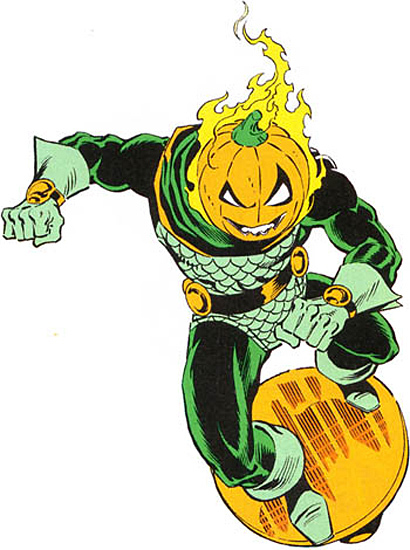 A second Jack-O-Lantern who looked the exact same as the original first showed up in Captain America issue 396 in 1992. That guy made a handful of appearances before getting his head blown off by the Punisher during the Civil War storyline in 2006. This Jack later returned as a super natural character in the vein of the Headless Horseman but Ghost Rider re-killed him. End of the line for the second Jack-O-Lantern. In the Spider-Man comics another Jack-O-Lantern showed up in 1996. This version went by the name Mad Jack and used a lot of Mysterio’s illusions because he/she/they had ties to the original Mysterio. I don’t feel like explaining their whole stupid backstory but supposedly they were both killed off panel so we don’t have to worry about them anymore. 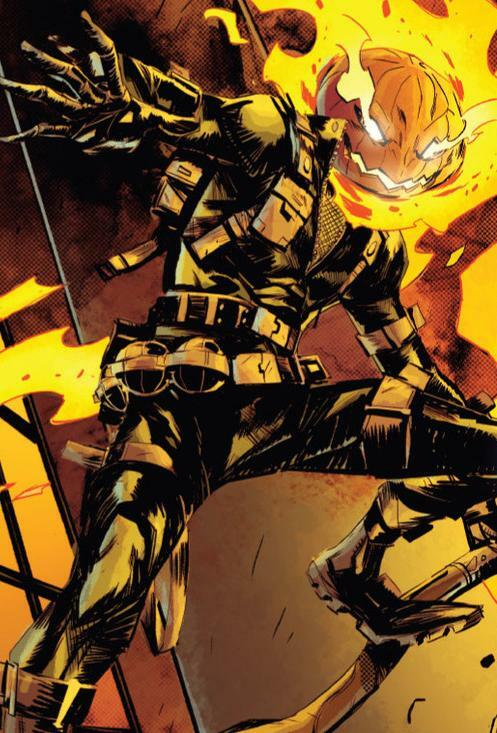 Most recently, a brand new Jack-O-Lantern was introduced in the Agent Venom series written by Rick Remender. This guy was a sadistic kid raised by the new Crime Master (another updated version of a classic Spidey villain). The new Jack wore a costume that was significantly different than those worn by his predecessors. He traded in the green spandex for a black costume covered in belts and buckles. He also swapped out the classic bouncing disc for a rocket powered broomstick like the one the Green Goblin flew around on in his early appearances. The new Jack-O-Lantern’s appearance had a creepy Halloween vibe to it that I quite liked. Remender wrote him with personality and it was the first time in a long time that a Jack-O-Lantern received some character development so I actually like him as an individual character and not just as a Macendale knock-off. 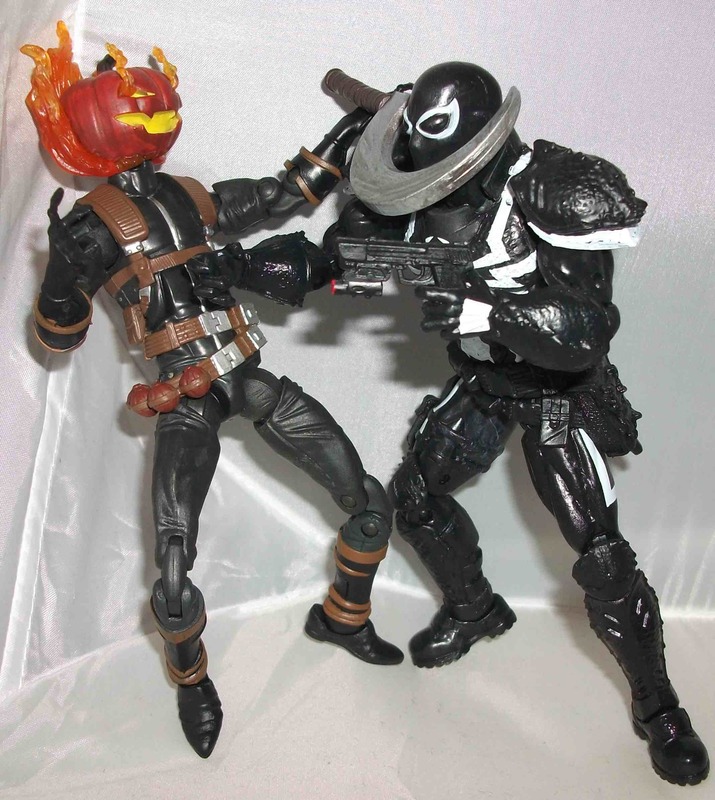 During an battle in their feud, Venom tossed a grenade into Jack’s pumpkin helmet horribly disfiguring him so that he had a sort-of pumpkiny face even without his mask on. It was a neat idea that further distinguished this version from the others. I hope this version sticks around for a while. This brand new Jack-O-Lantern figure was included in the latest wave of Marvel Legends; a Spider-Man focused line with an Absorbing Man build-a-figure. As I mentioned in my Spider-Gwen review a couple weeks ago, I scored the entire wave of seven figures from Strange Adventures thanks to my pal, Dave Howlett who manages the place (Sidebar: Dave does a lot of cool stuff online and in print. Check out his comic, Slam-A-Rama, or his podcast, Living Between Wednesdays). I would’ve preferred a classic 1980s Jason Macendale Jack-O-Lantern Marvel Legends figure but getting this version is pretty great too. The head on this figure is exactly what I wished my 1998 figure looked like. It’s got the small triangle eyes, the big grin with the 4 pointed teeth, and no nose. It looks awesome. The flame effect is really well done too with some translucent plastic on the back of the head as well as flames coming out of the eyes. 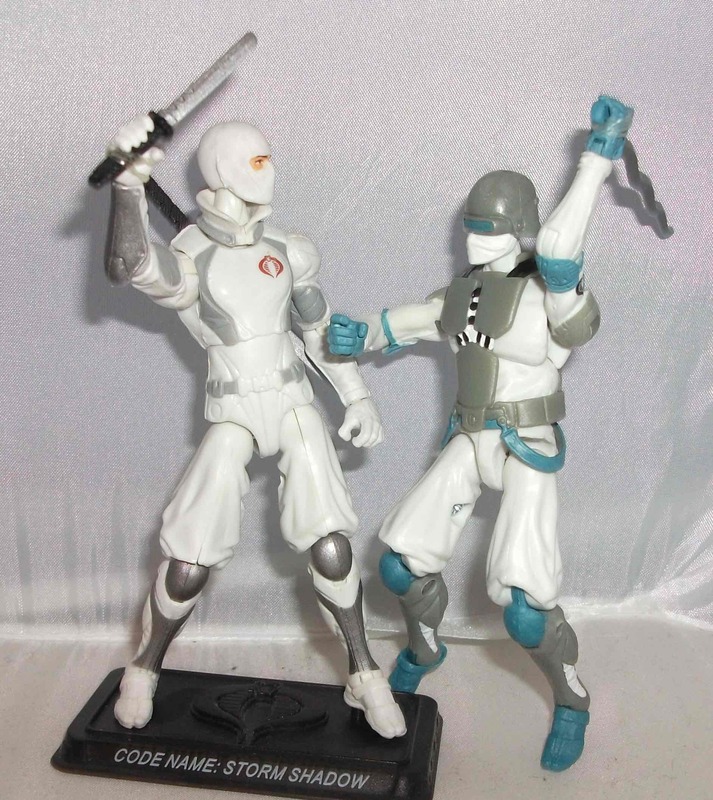 For the body Hasbro has reused the body of Ghost from their Thunderbolts boxset which was a San Diego Comic Con exclusive a couple of years ago. Surprisingly this body works just as well, if not better, for Jack than it did for Ghost. When I compare this figure to the Jack-O-Lantern drawings in the Venom comic I’d swear this figure was designed specifically to match the art. The body is lean and lanky with lots of belts and buckles and long creepy fingers. The addition of a new belt seals the deal. I have zero complaints about the reused body. 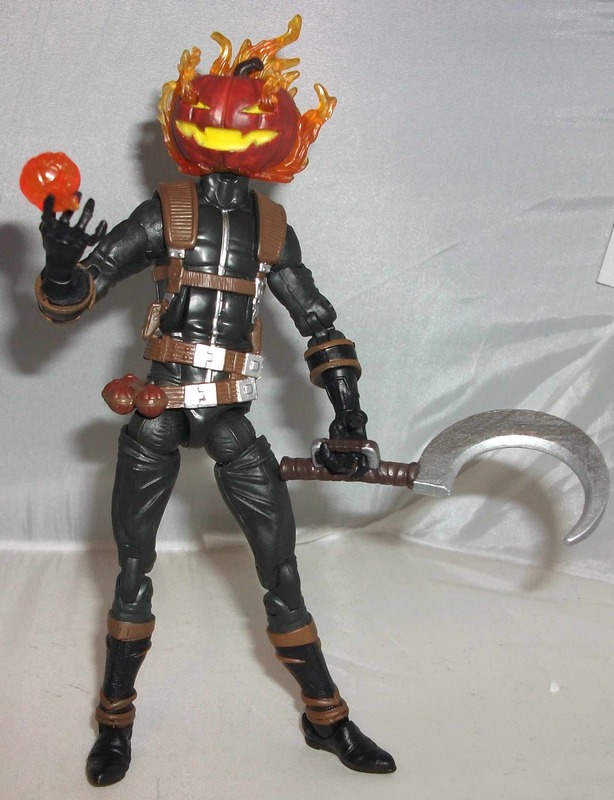 For accessories Jack comes with a piece of the Absorbing Man, a pumpkin bomb, a gnarly scythe weapon, and his rocket broomstick. Finally, Jack-O-Lantern has his conveyance. 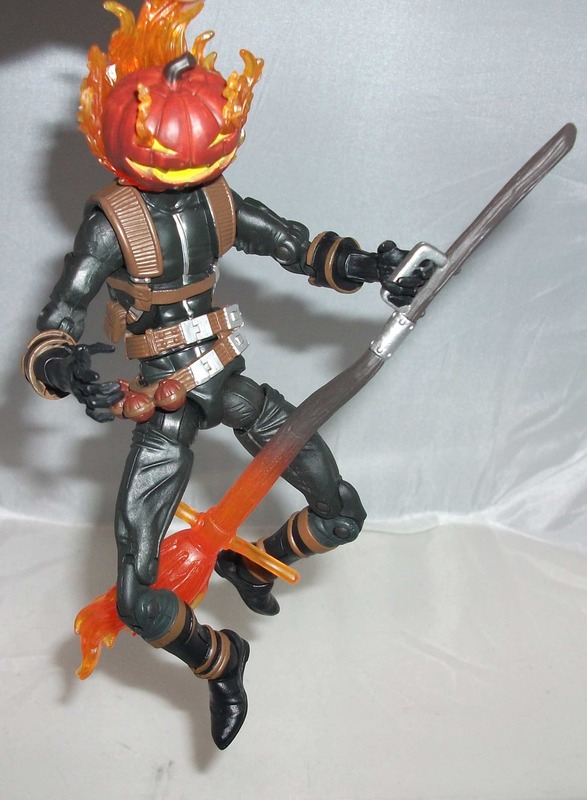 I’ll keep my fingers crossed for a Marvel Legends version of the original Jack-O-Lantern (complete with his hover disc) but in the meantime this figure fills my Jack-O-Lantern figure needs. 10 out of 10. This is part 1 of a 2-part review. Originally I had planned to review my new Marvel Legends Jack-O-Lantern figure today but since I was hauling out my 90s figure for a comparison shot I decided I might as well review him too. The Hobgoblin was Spider-Man’s arch nemesis at the time and he had just framed Spider-Man’s friend Flash Thompson for his crimes. So Flash was awaiting trial while the real Goblin was at large and scheming with the Kingpin. Jack-O-Lantern was a bad guy on the rise trying to establish himself in New York’s underworld. After first appearing in Machine Man’s book in ’81, Jack tangled with Spider-Man a couple of times but he had never been a major player in Spidey’s rogues gallery. In this issue he determined that breaking the Hobgoblin out of prison was a way to make a name for himself and get into the Goblin’s good graces. He liberates Flash not realizing that he’s actually screwing up the real Hobgoblin’s plan. Gobby goes after him and the two villains end up in a glider dog fight over the streets of New York. Jack takes a beating but actually gets the better of Hobgoblin and makes his escape. I was hooked. I absolutely loved Jack-O-Lantern’s design. He had dark green tights with a lime green chainmail leotard over top, buccaneer boots, a flaming pumpkin on his head and he bounced around on a hovering yellow disc. I know it sounds ridiculous but it looked super cool I swear. 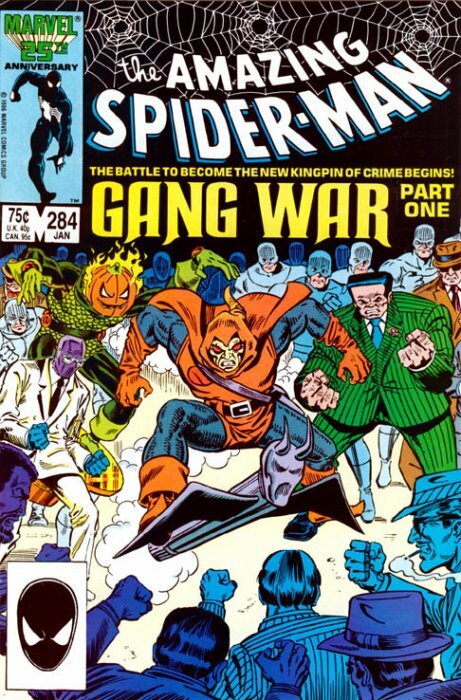 Just glance over at the cover to issue 284 when a gang war erupted stemming from Jack-O-Lantern’s criminal ambitions. How can you not love this guy? 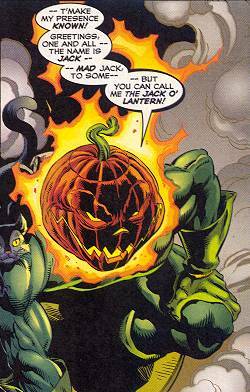 Jack-O-Lantern, whose real name was Jason Macendale, cemented his place as one of Spidey’s main villains when he had the Hobgoblin assassinated in issue 289 and then took over his identity. It was a total baller move pulled off by what was considered a low level villain. I hated to see Jack’s flaming pumpkin disappear from the comic pages mere months after discovering him but I loved seeing the character grow into a real threat as the new Hobgoblin. This figure was released by Toy Biz in 1998 as part of it’s Spider-Man toy line based on the 90s cartoon. Macendale never actually appeared in the show as Jack-O-Lantern so I was surprised, but delighted, that this figure was even made. 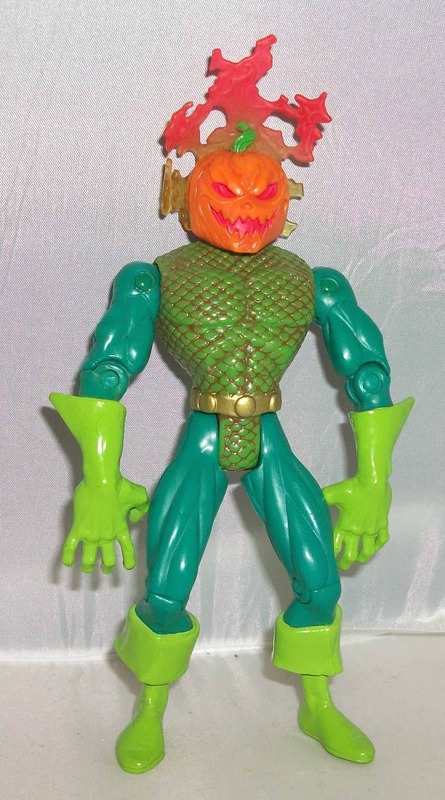 I’d wanted a Jack-O-Lantern figure desperately as a kid so it was cool to finally be getting one even if it was a couple of years after I graduated high school. This figure has really over-sized weirdly sculpted arms and I can’t for the life of me figure out why. They either hang at his side like a couple of salamis or you have to pose him like he’s constantly scratching at his crotch. A swivel joint at the wrists or forearms would have helped this figure dramatically. Why doesn’t the paint on his boots and gloves match the chainmail bathing suit? They’re supposed to. I appreciate that Toy Biz put a brown paint wash on the torso to show off the sculpted detail but it makes for a dark and weathered chest piece that looks odd with the clean and neon-bright limbs. Jack came packaged with a big pink bug that spit pumpkins. Lots of Toy Biz figures came with big useless accessories that I immediately tossed into a spare parts bin never to be seen again. If you want to pack big useless missile-launching bugs with characters like Spider-Man, Swarm, and Tarantula in order to appeal to little kids I’m fine with that; those characters wouldn’t need accessories anyway. But don’t give a bug to Jack-O-Lantern if it means robbing him of his trademark pogo ball. Stupid decision. 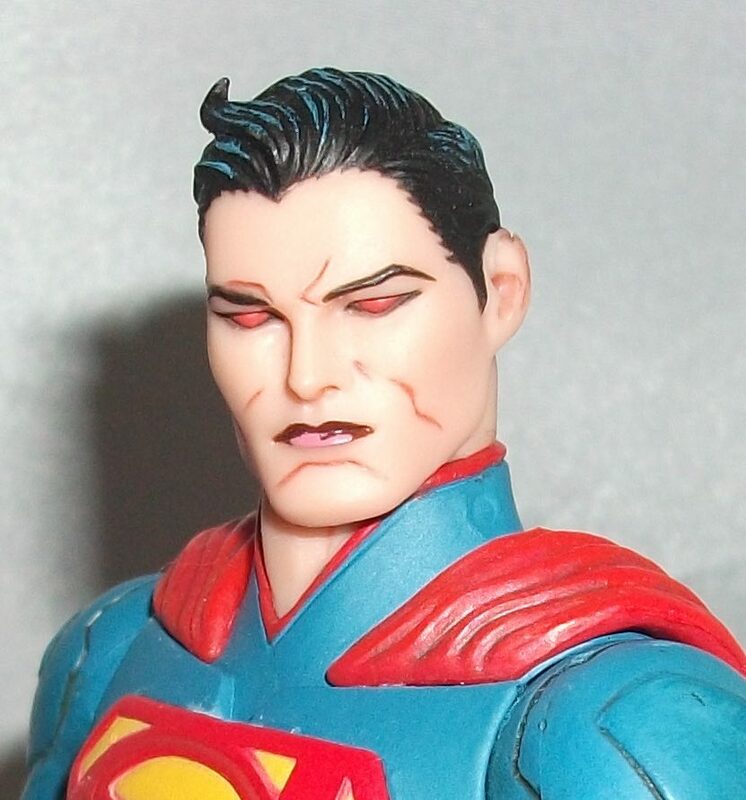 Lastly, as nice as this face sculpt is, it does not look like Jack-O-Lantern…at least not the original version. Macendale usually had two triangle eyes and a smile with 4-pointy teeth. It was a very simple design which I have replicated on plenty of real pumpkins over the years. This face is too detailed. It’s got too many teeth, too many wrinkles, its eyes are too emotive, and worst of all it has a nose. This is not the Macendale Jack that I love. This is the face of the imposter who ripped off his gimmick many years later and went by the name Mad Jack. 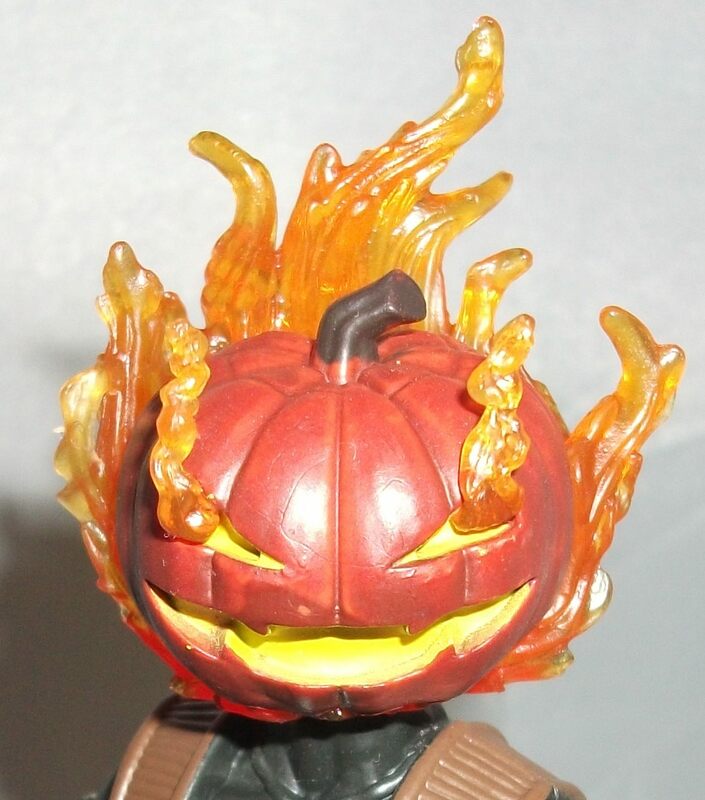 I’d be fine with getting a Mad jack figure but not at the expense of an original Jack-O-Lantern figure. As you can see, I have mixed feelings about this figure but at the time I was sure it was the only Jack-O-Lantern figure I’d ever get so I made peace with its problems and rejoiced that I had it at all. 7 out of 10. 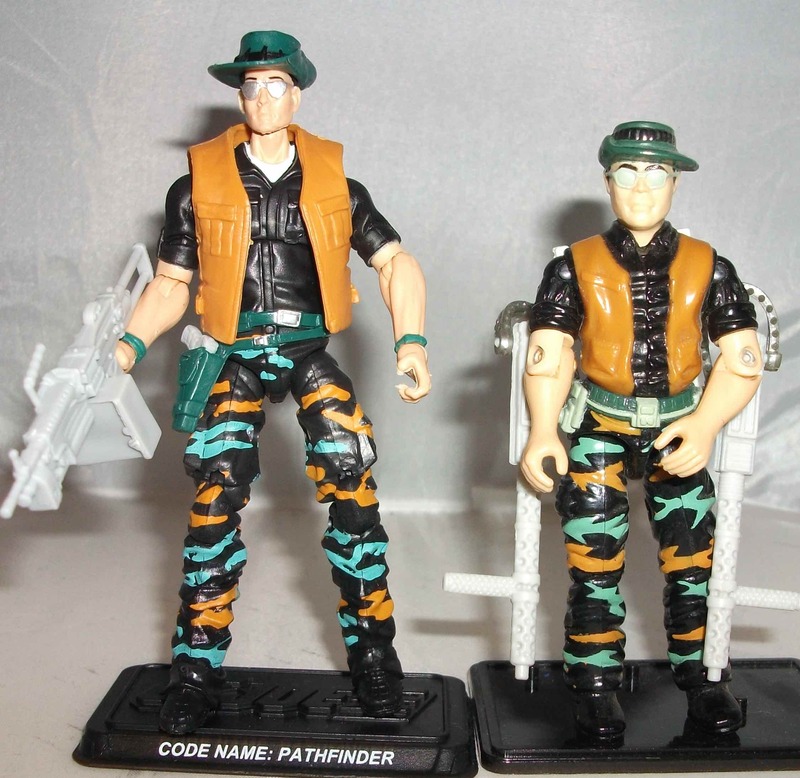 The first Pathfinder figure was released in 1990, the year I quit collecting G.I. Joes as a kid. The only figure I owned from that year’s assortment was Rampart. For that reason I have little attachment to the characters released that year and the final 4 years of the brand that followed. But that’s not to say that Pathfinder was a bad figure. The original featured a completely new sculpt and some pretty unique accessories. 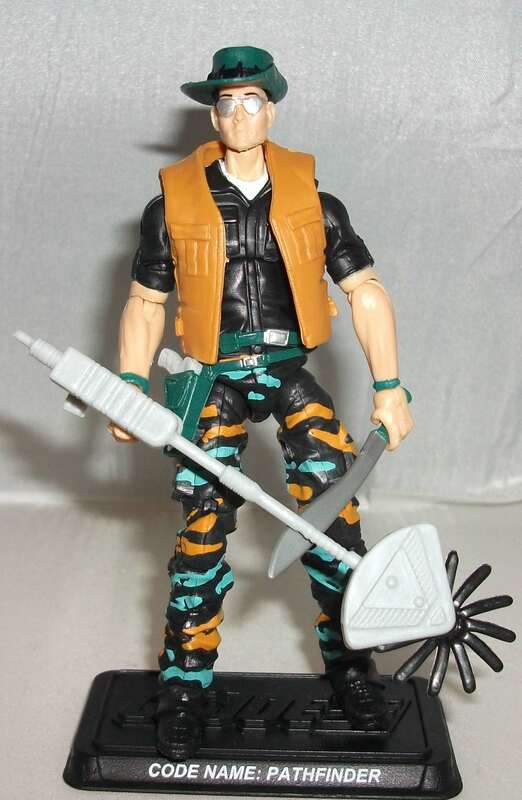 Like Recondo, he was a a jungle trooper but Pathfinder’s specific area of expertise was making trails where there were none, hence his code name and his weed whacker with spinning blade. 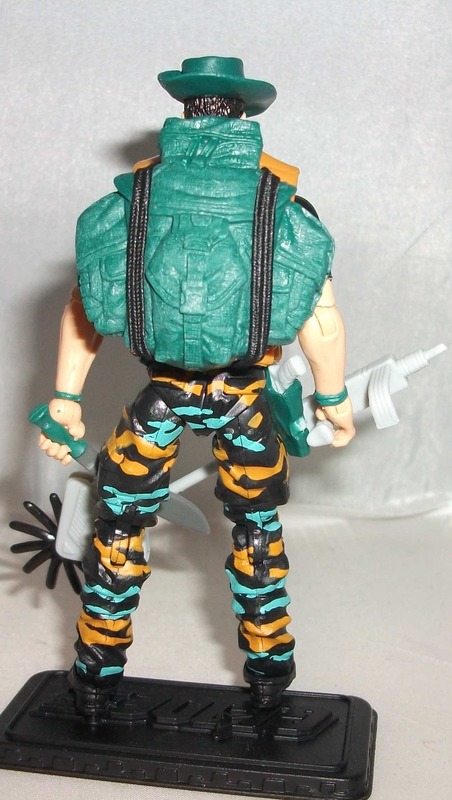 The card art made it look as though he was wearing a fisherman’s bucket hat but the actual figure sported a safari style hat with one side pinned up just like his jungle buddy Recondo. 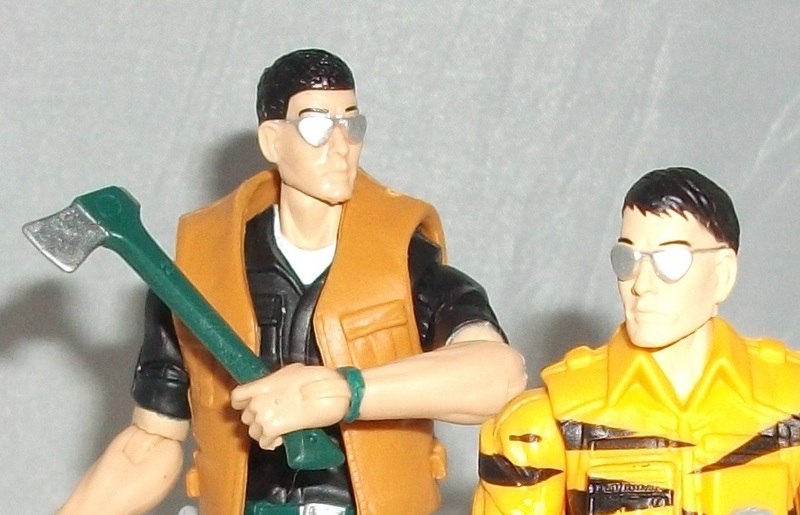 Pathfinder also had sunglasses sculpted onto his face and a vest sculpted onto his torso. There is nothing overly exciting about the design but I appreciate the real-world look at a time when Joe figures were getting more and more fantastical. I did eventually acquire that original Pathfinder figure in the Epic Haul I received 2 years ago courtesy of Eric (are you still reading, man?). Pathfinder had only been re-released once (a bland solid-gray repaint in 2001) before this new version hit mail boxes a couple of weeks ago. Pathfinder version 3 is the first ever modern-era version of the character and it was included in the G.I. Joe Collector’s Club FSS 4.0. He shipped out with Jammer, the subject of my previous review, in the third of six mail outs. Completely opposite of the 1990 original, the 2016 Pathfinder is constructed entirely of reused parts. That’s not necessarily a bad thing though as parts reuse is an inevitability in this day and age; the key is using good parts and that’s what the Club has done here. Pathfinder’s got the baggy pants legs of the G.I. Joe Retaliation Trooper and the torso and arms of 2013’s Kwinn. The parts work together nicely and give him some bulk which he would need to lug that weed whacker through the jungle. Obviously I would’ve preferred a unique head sculpt but the Club went with Lifeline’s head and it makes for a pretty good stand-in. Between the sculpted shades and the inclusion of Recondo’s removable hat this head looks like it was intended to be Pathfinder all along. I do find the head a wee bit small for the Kwinn torso but it’s not too bad. The hat fits pretty good as long as you flip it the opposite way of the original. Pathfinder’s vest is also removable on this version. The vest seems a tad oversized but the Club was limited in its vest selection so i don’t fault them for that. All in all it’s a nicely put together figure. The paint job perfectly replicates the original and it’s what allows me to forgive some of the proportion issues. The colours look really great especially the crazy camouflage pattern on the pants. The brown and green paint used on the pants matches up very well with the brown and green plastics used for the vest, hat, and belt. For accessories Pathfinder includes a machete, a pistol that can be holstered on his hip, a backpack which fits nicely despite the vest, a flashlight that can be stored inside the backpack, an axe, a machine gun, and of course the weed whacker. It’s a good lot of stuff that is all appropriate for the character. Some fans may be sad to see that the twin hip-mounted guns of the original are not present here but I’m not bothered by it. 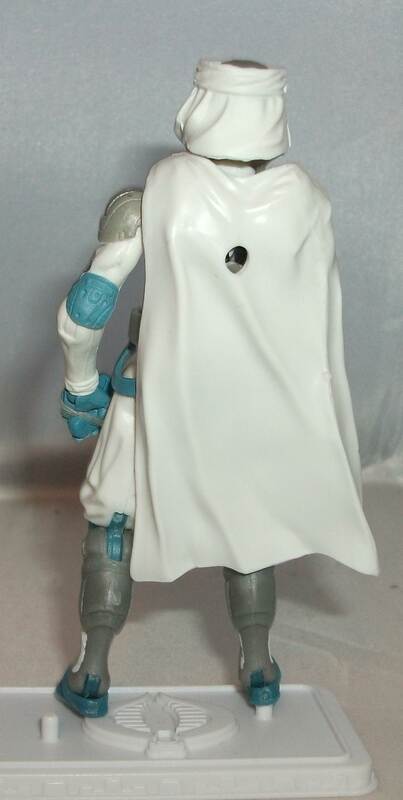 This is a decent Joe figure and I feel the Club did the best it could with the existing parts library. It may not be perfect but I’m always happy to add unique characters to my shelves. 7 out of 10. Two more Figure Subscription Service Joes arrived in the mail last week. The third shipment contained the first ever modern-era versions of Pathfinder and Calvin “Jammer” Mondale. Today I’m gonna take a look at the latter. 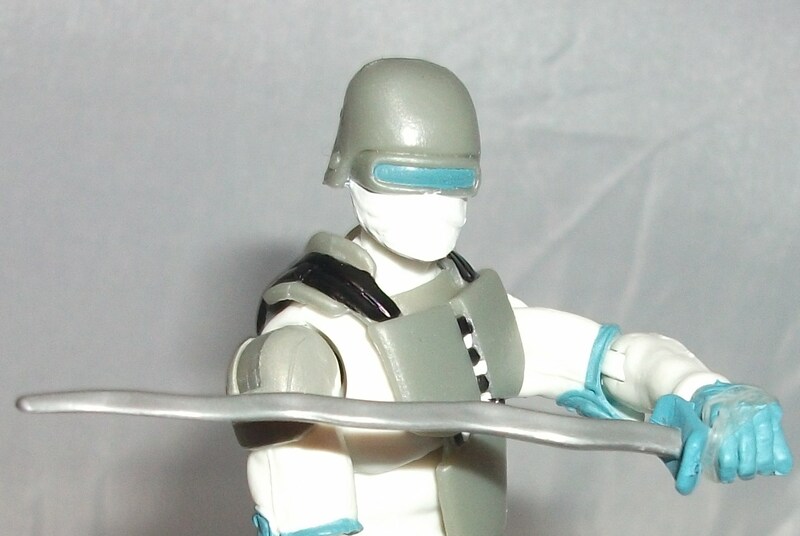 One of the 13 original Real American Hero (RAH) Joe figures released in 1982 was Stalker, the Joe team’s Ranger. 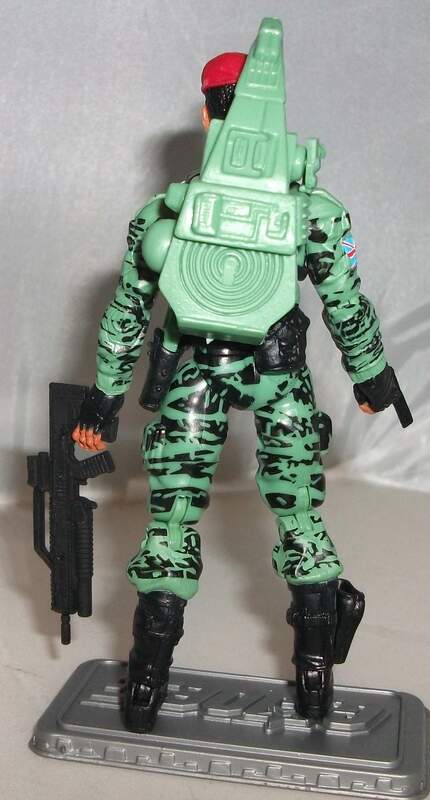 All of the OG13 shared body parts and some of them even shared the same head but Stalker was unique because he had a wholly original head with a sculpted beret (the other guys had removable helmets). Also noteworthy is the fact that Stalker was the only African-American on the team. When that original Stalker figure was released internationally he underwent a few changes. In Mexico a figure practically identical to Stalker was renamed Cheetah, in Argentina he was released with a blue uniform and white skin and renamed Manleh. In Brazil he was called Triton and in Europe he was renamed Jammer and he was available in three paint variations; a solid green uniform, green camo, and black camo. 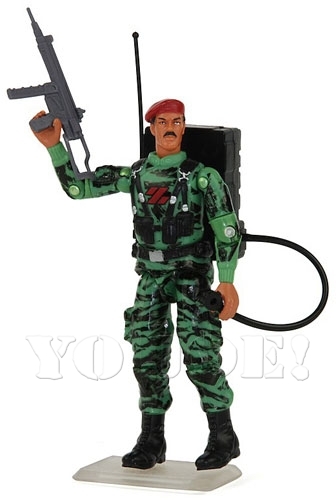 All three versions featured a red beret instead of Stalker’s standard green one and they all had a red Z-Force logo on their chest. 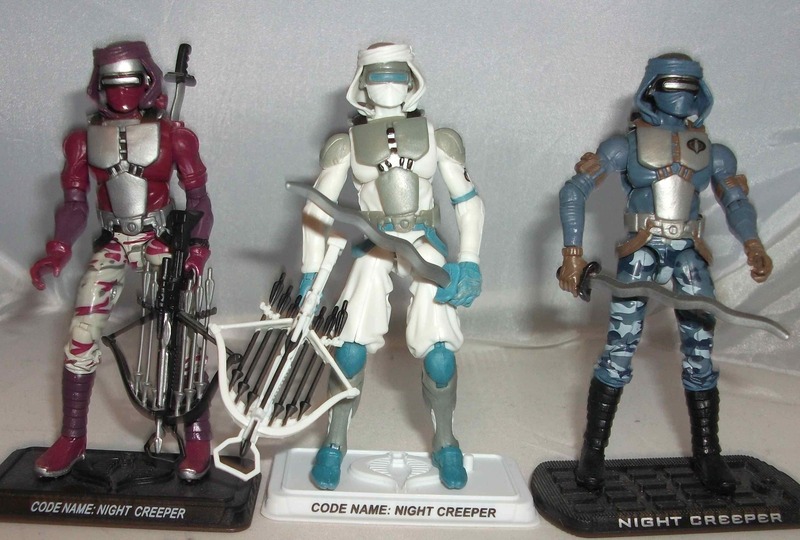 The various Jammer figures are highly sought after by many collectors. Jammer got his first official American G.I. 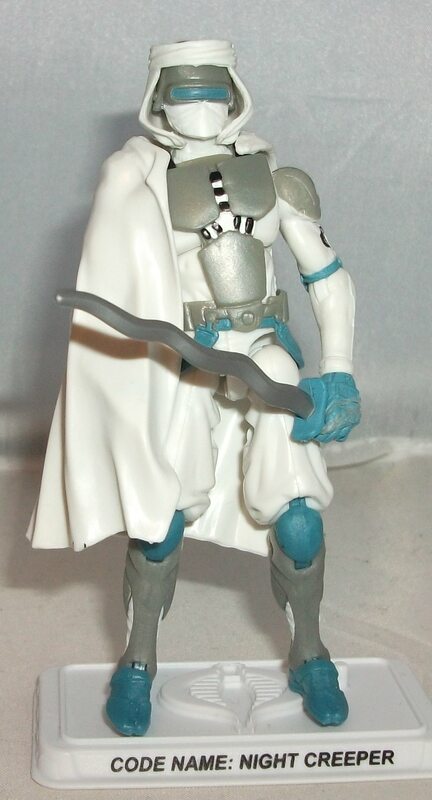 Joe figure in 2010 when he was included in a Z-Force themed 3-pack released by the Collector’s Club at that year’s Joe Con. I believe the 2010 file card is the first time he was given the name Calvin Mondale and a backstory. According to the file card he grew up in New York and California before moving to the United Kingdom to join the Z-Force unit of their Special Action Force (SAF). 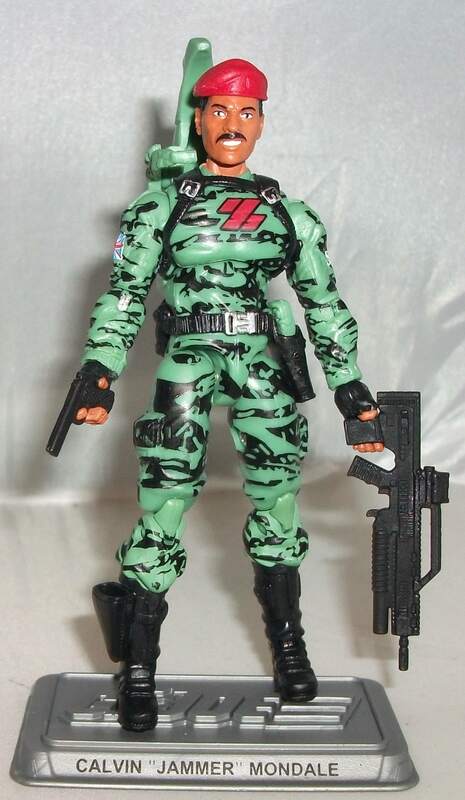 In the spirit of the original UK figure, the 2010 Jammer was made by repainting a Stalker head with a red beret and adding the Z-Force logo to the chest of the figure. The camo pattern the Club used on his uniform was similar to Stalker’s blotchy pattern but darker and more marbleized. For this 2016 version of Jammer released as part of FSS 4.0, the Club homaged their own 2010 version. 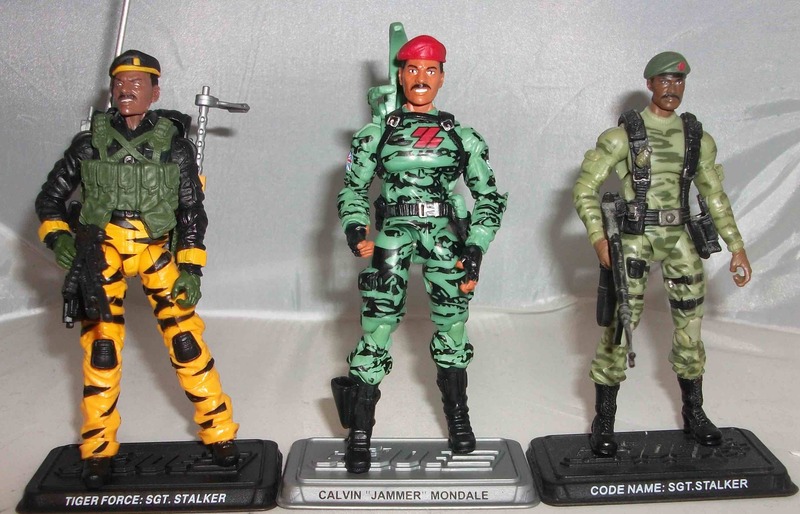 This figure’s camouflage is clearly based on the 2010 look more so than any of the UK Jammer figures. I’m glad they went that route because I think this paint job looks really bold and its visually appealing. This is my first Jammer figure and I didn’t expect to be excited about it. I was anticipating an unimaginative Stalker repaint with a red hat and a Z on his chest but this figure has surprised me. Yes, the uniform is a green camo pattern from head to toe which has always been Stalker’s thing but this pattern is different enough to stand on its own. Call me crazy but i can look at this figure and not see Stalker staring back at me. 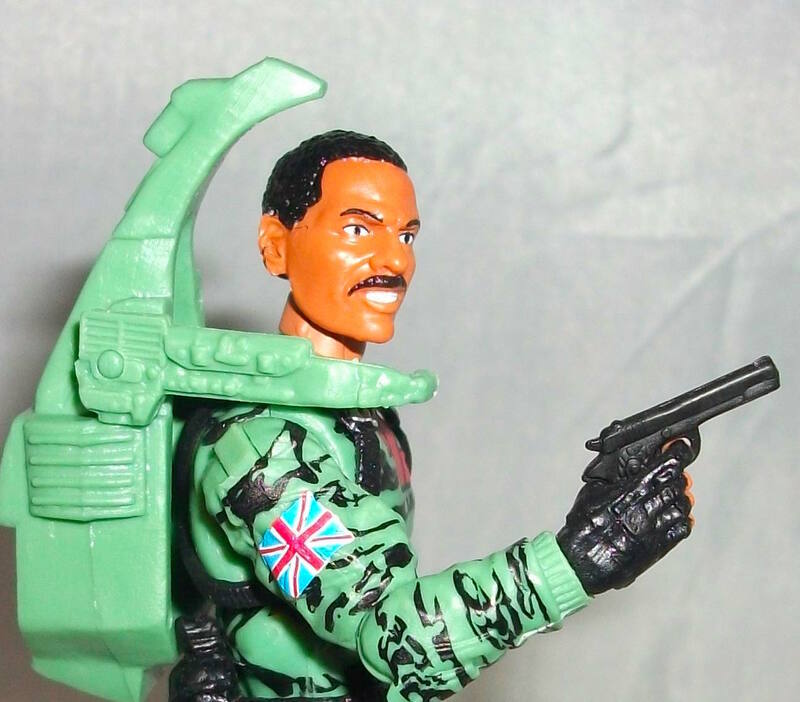 Little details like the Union Jack on his right sleeve and the SAF patch on his left individualize this figure even further. From the neck down Jammer is made up of generic pieces we’ve seen plenty of times before but its a good solid build . His hands are a little gimpy so he can’t hold all of his accessories but otherwise the body is fine. The head is naturally a Stalker repaint. This was a brand new head sculpted by Boss Fight Studios for last year’s Tiger Force Stalker and it’s a beautifully detailed piece that features a removable beret. It makes sense that the Club would want to get more use out of this piece so I think it was a good choice to use for this figure. I like that his skin is a light mocha colour which continues to differentiate him from Stalker who has a darker complexion. The last thing to mention would be his accessories. Jammer has a machine gun, a pistol that can be holstered on his boot, and a green cell phone that can be stored on his belt. I love his little phone but unfortunately neither of his hands can grip it.Since Jammer’s speciality is jamming insurgent communication systems he also comes with Dial-Tone’s funky communications backpack. Lastly, he comes with a silver display base just like his fellow SAF members T.N.T. and Quarrel. This figure doesn’t really bring anything new to the table but I find myself really liking it anyway. 8 out of 10. Last year there was a storyline that spanned many Spider-Man related comic books called “Spider-Verse”. The premise was that a group of vampire-like dudes called the Inheritors were traveling to various dimensions and sucking the life force out of each dimension’s version of Spider-Man. Once the “real” Spider-Man got wind of this he teamed up with all the other spider-pwered men and women from across the multi-verse to defeat the Inheritors. I didn’t think it was great, largely because the inheritors are rather bland villains, but there was a fair amount of fun to be mined from the premise. Spider-Verse featured appearances by every Spider-Man you can think of including the 60s animated Spider-Man, Star Comics’ Peter Porker: Spider-Ham, and the black & white newspaper strip Spider-Man. It also brought back all of the transformed and mutated versions of Spidey we’ve seen over the years such as Cosmic Spider-Man and Spider-Hulk. There was no shortage of Spider-Men to pick from and yet the writers and artists went ahead and created a bunch of new variations anyway like Spider-Punk and Lady-Spider. One of the new spider people was from an alternate reality where it was Peter Parker’s girlfriend, Gwen Stacy, that got bit by the radioactive spider instead of him. The result was Spider-Gwen. She didn’t actually call herself that in the comic because that would make her secret identity obsolete but that was the title of the book that introduced her. In Gwen’s world she goes by the name Spider-Woman (yes, another one). 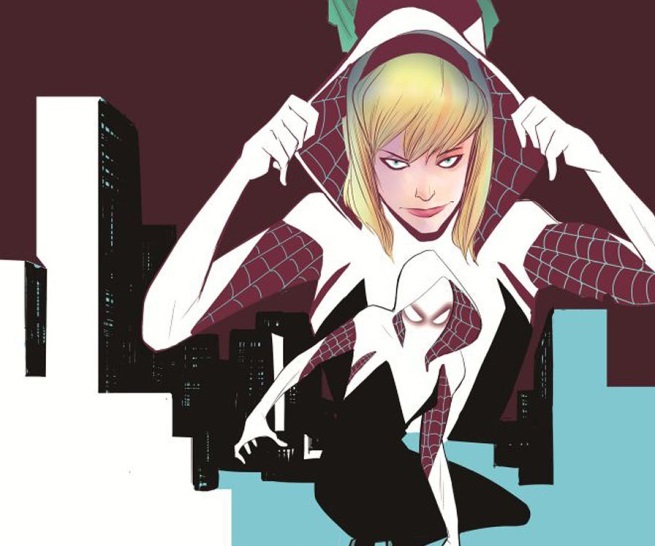 Spider-Gwen’s costume design was really cool and quite different from any spider costume we’d seen before. She caught on with fans immediately and within weeks of her introduction you could find pictures of multiple Spider-Gwen cosplay outfits online. She was given a fairly large part to play in the Spider-Verse saga and as soon as it wrapped up Marvel gave Gwen her own on-going series. She’s also a member of the ensemble cast featured in the new team book Web Warriors which features a bunch of the other fan favorite spider heroes from Spider-Verse. It’s fair to say that Spider-Gwen is a bit of a phenomenon. I think she looks cool but I haven’t bothered to read her solo series. I picked up her introduction story and the first issue of her on-going but they failed to reel me in. At this point I feel I’ve read a few too many variations of a teenaged spider-hero coming of age. Even alternate reality versions of established Spidey villains used to be fun but now they feel played out. That said, I’m glad Spider-Gwen has found an audience and I’m sure it’s exciting for younger fans who haven’t seen these storylines a hundred times before. 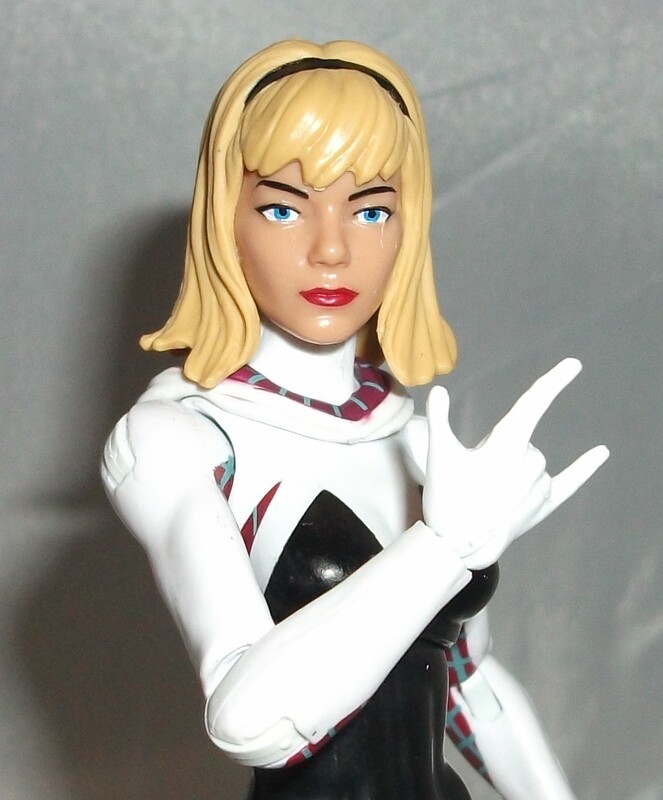 Spider-Gwen’s popularity is further evidenced by how quickly Hasbro produced an action figure of her. She was included in their latest Spider-Man themed wave of Marvel Legends which features an Absorbing Man build-a-figure. I’ve been eagerly anticipating this wave so I was pretty excited last week when my pal Dave over at Strange Adventures Comic Shop texted me to say they had them in stock and he was giving me the first crack at them. I said I wanted them all and he gave me a good deal which was awesome (you rule, Dave). That text saved me from hunting these figures down one-by-one all over the city and it enabled me to build a complete Absorbing Man. Dave also hooked me up with the final pieces I needed to complete my Rhino and Hulkbuster build-a-figures so my Marvel Legends shelf just got a whole lot more crowded. I’m very pleased with how Spider-Gwen turned out. 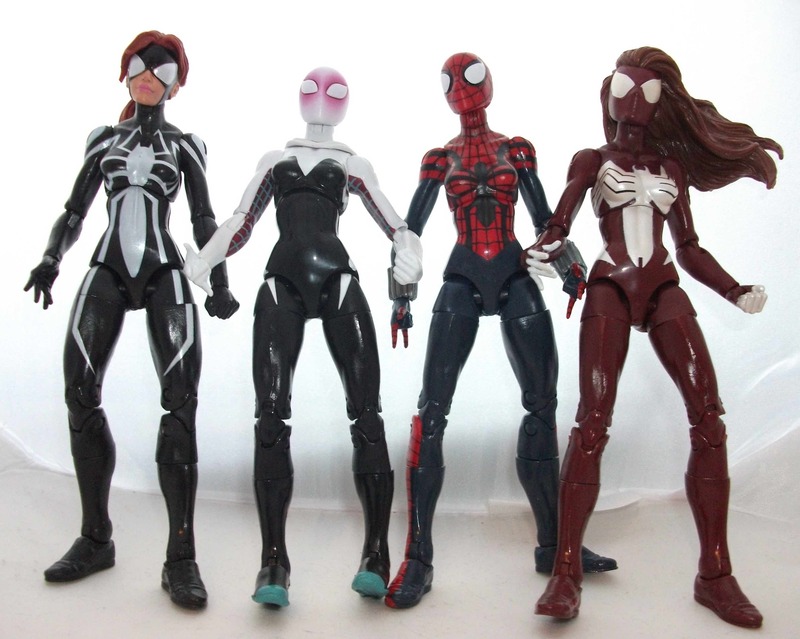 The body is the same one we’ve seen on fellow teenaged spider-powered females like Spider-Girl, Black Widow, and Arana. The eye-catching paint job distinguishes this figure from the others though. The stark contrast of black and white always looks good and the powder blue webs on the purple areas looks really sharp. The removable hood is sculpted very nicely and it sits proportionately on her shoulders. As an added bonus Spider-Gwen has a couple of awesome accessories. She has an alternate unmasked head which is something I wish all figures included. Why don’t I have a Peter Parker or a Mayday head? My new clone Spider-Man figure would be so much cooler if it had an alternate Ben Reilly head. I hope the inclusion of Gwen’s unmasked head is a trend we see continued. I would’ve preferred a long haired John Romita style Gwen but the head provided is a pretty good representation of the Emma Stone Gwen which isn’t a bad substitute. Another neat little extra detail is that Gwen includes a downed hood that can be put around her neck with the unmasked head. Lastly, she came with Absorbing Man’s ball and chain which is a must-have for any respectable Absorbing Man figure. This Spider-Gwen is a home run which I’m sure will please her legions of new fans. 9 out of 10. Vanessa got me a bunch of cool stuff for Christmas this year including five action figures but I haven’t gotten around to reviewing any of them until now. 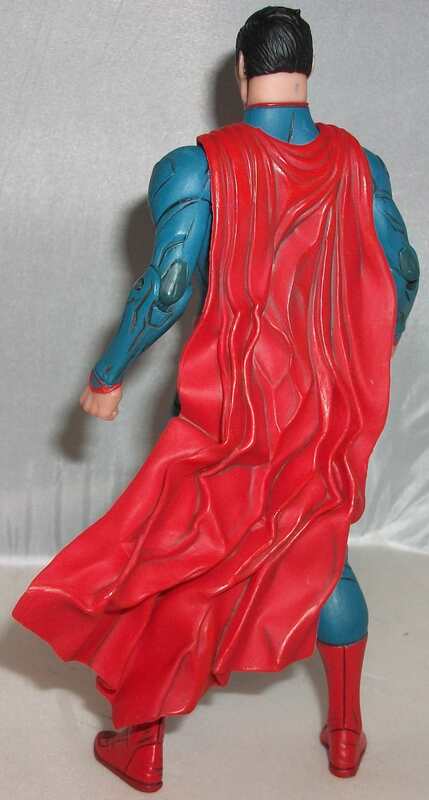 Four of them were Star Wars Black Series figures and the odd man out was this Superman figure by DC Collectibles. I’m a DC fan but the figures are generally a low priority in my toy collection. I grew up a hard-core Marvel kid so I’ll happily waste a ton of money collecting of all the random D-list Marvel figures but with DC I tend to stick mostly to mainstream characters. I also try to avoid multiple versions of the same character. I don’t mind owning dozens of Spider-Man and Iron Man variations but when it comes to DC heroes like Flash or Green Lantern I try to find the single most iconic and cool figure available and leave it at that. 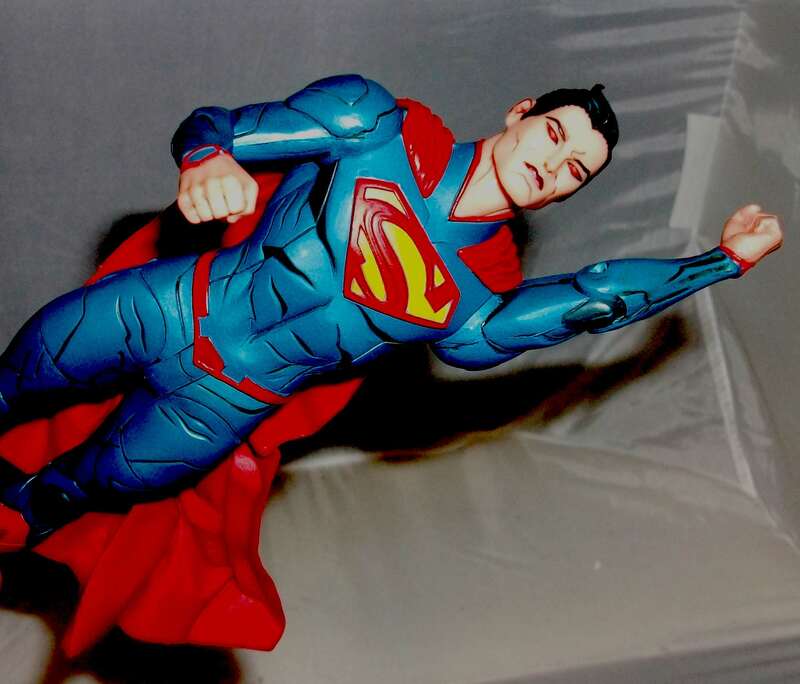 For the past 10 years the one Superman figure in my modern toy collection has been the DC Direct 2005 version based on Ed McGuinness’s artwork from the Public Enemies (PE) storyline. I love McGuinness’s exaggerated cartoony style and I thought the DC Direct sculptors captured it beautifully in their PE line. 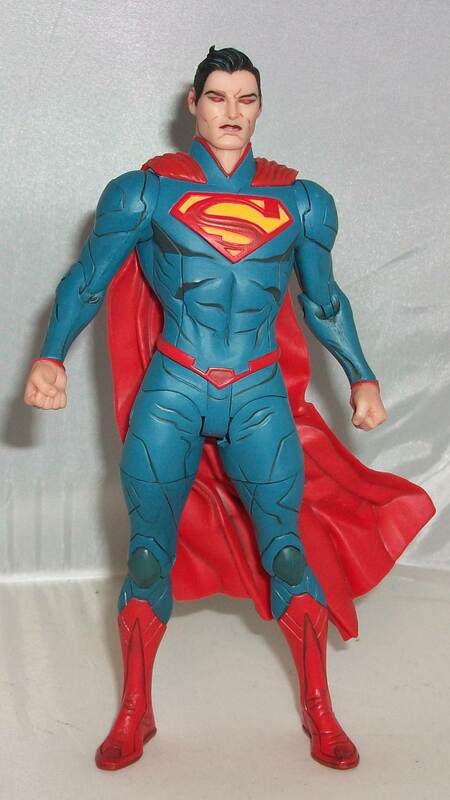 Many great Superman figures have been released since then but none of them could dethrone the beefy squinty-eyed McGuinness version. However, my one version rule went out the window when DC Collectibles unveiled this beauty based on the artwork of Jae Lee. I wouldn’t say it dethrones the McGuinness version because they’re so different but it was definitely a must have for me. I can’t recall the first time I saw Jae Lee’s artwork, he’s done a smattering of work for both Marvel and DC since the 90s, but I know when I became a fan. In 2004 he illustrated a Transformers/G.I. Joe crossover for Dreamwave, a Canadian company that published Transformers books for a few years in the early 2000s. The story was set in WWII which was an interesting concept but it was Lee’s pencils that really left an impression on me. Everything was so dark and mysterious and the period-accurate character redesigns were amazing. In 2013 DC launched a new Superman/Batman team-up book with Lee as the primary artist. 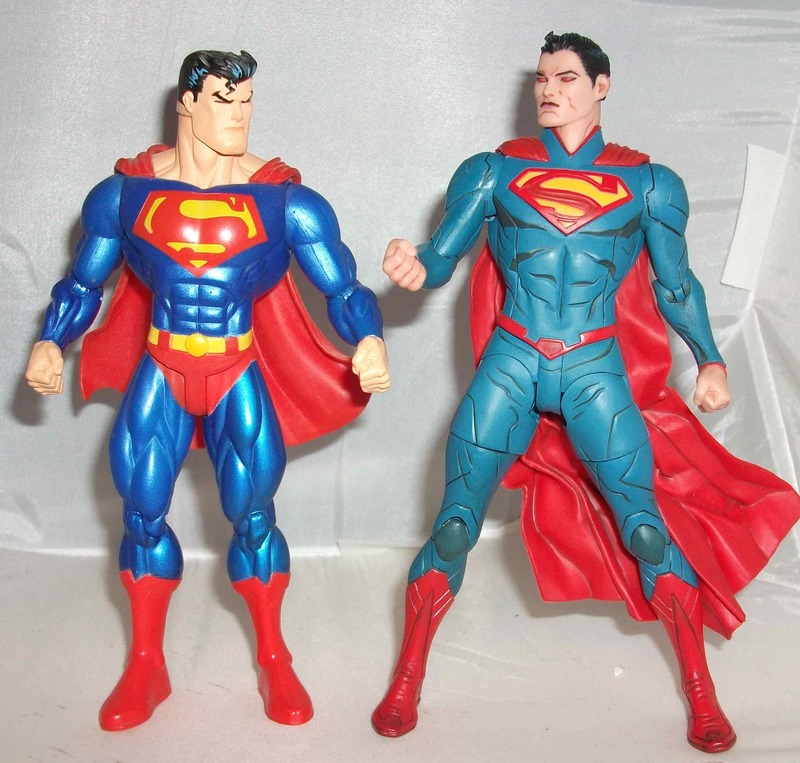 That series is what inspired DC Collectibles to release a wave of figures based on Lee’s unique take on four DC icons; Batman, Catwoman, Wonder Woman, and Superman. This figure may not be everyone’s cup of tea but I love it. It looks like Lee’s pencils have leapt off the page and I’d have thought that would’ve been near impossible to pull off given his unconventional style. I think the New-52 era costume looks great as rendered by Lee. There’s a lot more line work for him to play with than there would have been on the classic tights. The head sculpt is very well done too and the paint job highlights all of the sculpting work. I think the red eyes give him a very alien look that we haven’t seen before. This is kind of a dark and scary Superman which is the polar opposite of the bright and polished McGuinness version. One thing I particularly love about this figure is the cape. It’s a just a rubbery mass of folds but it looks surprisingly realistic. It’s one of the best action figure capes I’ve ever seen. My McGuinness figure has an embarrassingly small hand towel on his back so this figure definitely trumps him in the cape department. This is an awesome figure that I’ve been looking forward to reviewing for months but the real reason I selected it today is because I wanted to talk about Batman V Superman: Dawn of Justice. I saw it on opening day but I wanted to give everyone time to see it before I blogged about it. The thing is, after some thought, I realized that I don’t have much to say about it. I didn’t like it but I didn’t hate it either. I think Man of Steel lowered my expectations to such a point that it would have been impossible for me to be disappointed by its sequel. I think you have to be passionate about something to get worked up over it and this movie didn’t make me feel much of anything. I could rant and rave about what I dislike about DC’s burgeoning cinematic universe but I feel it’s already been said to death in every corner of the internet. I will say that I saw flourishes of potential for future movies, Affleck showed promise as Batman and Wonder Woman looked pretty hot and tough, but sadly it was Superman who got shortchanged yet again (not to mention Jimmy Olsen). I still think Henry Cavill could make a great Superman with the right material but BvS didn’t do him any favours.